Cooling specialist Noctua has released a second generation thermal compound, an enthusiast-level material designed for tiptop performance and endurance. 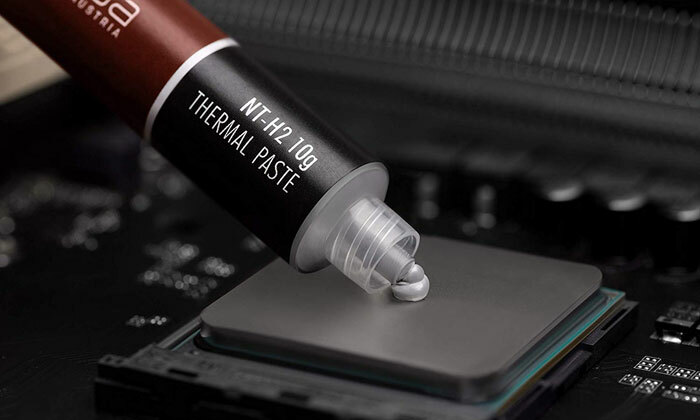 The new thermal compound, the successor to the well-regarded Noctua NT-H1 which has been available for the last decade or so, is called NT-H2. Additionally Noctua has introduced its NA-CW1 cleaning wipes which help users remove all traces of previous thermal compound applications before renewing it with something like NT-H2. In an email to HEXUS, Noctua said that its new NT-H2 thermal compound builds on the "proven features, superb ease of use and renowned long-term stability," of NT-H1 with a fine-tuned formulation of microparticles. It adds that the mixed metal oxides chosen provide "even lower thermal resistance and reduced bond-line thickness at typical mounting pressures," compared with NT-H1. Moreover, in internal standardised tests, Noctua researchers saw temperatures decrease by as much as 2.1°C. 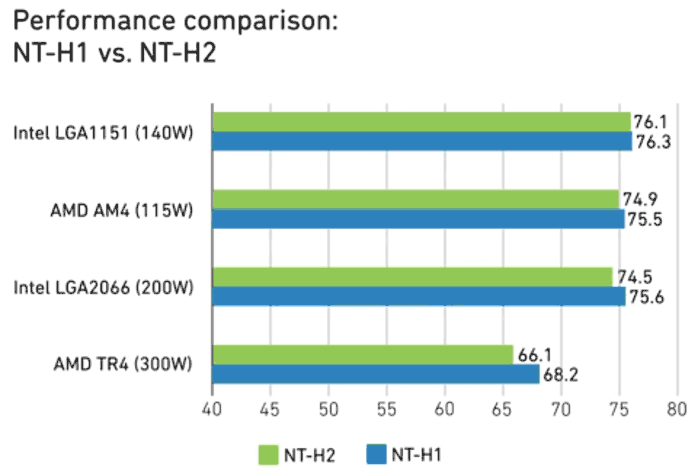 If you are interested in using Noctua NT-H2 in upcoming systems, the firm would like to remind you that this compound, like its predecessor, requires no break-in period, it is electrically non-conductive and non-corroding, and it can be applied to CPUs for as long as 5 years without performance degradation. If you are reapplying thermal paste on your CPU or GPU then thoroughly cleaning off the old stuff is important. To this end, Noctua has produced the NA-CW1 cleaning wipes for easy, convenient, and efficient cleaning. These moist wipes use a "custom detergent mixture," but we know little else about them. 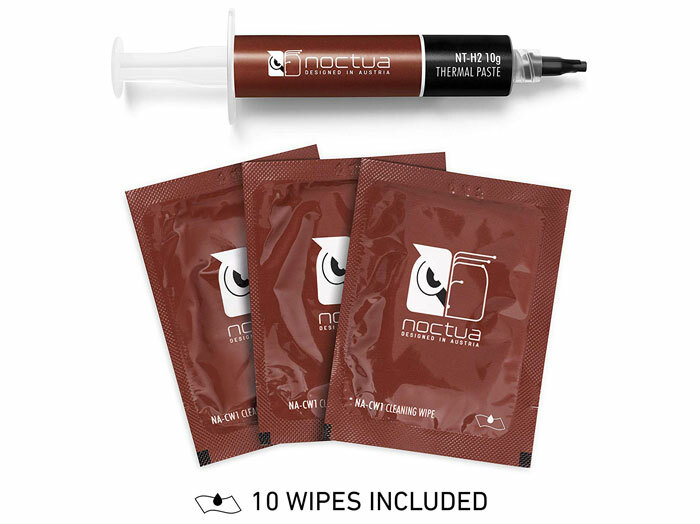 If you are going to buy some Noctua thermal compound then you might be happy to know that a quantity of the NA-CW1 cleaning wipes will be provided for free. Standard 3.5g and extra-large 10g NT-H2 packages include three (3.5g) and ten (10g) NA-CW1 cleaning wipes, respectively. Noctua will still sell its NT-H1 compound and it is also now being produced in larger 10g tubes. Meanwhile if you just need the wipes, a set of 20 (product code NA-SCW1) will be sold separately. Here in the UK I see that the Noctua NT-H2 10g pack, pictured above, is available for £21.99 via Amazon UK, and ready to ship. Wonder how it compares to Thermal Grizzly? One to keep a tentative eye on, I think.